Just a quick update to say that my newest tutorial has been posted at Craftzine [now Makezine], where yarn projects are being featured all month long. The place card design is an example of easy-to-make flowers composed of crewel yarn and quilling paper. The leaves are made with the paper folding technique called alternate side looping and the flower centers are quilled tight coils. You might also enjoy stopping by Patricia Zapata's A Little Hut blog to print out these stylish (and free!) 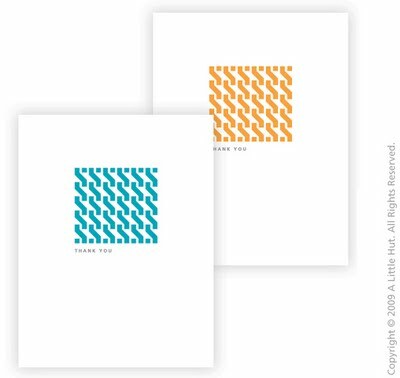 thank you notes that she designed. Patricia, as you may recall from an earlier post, is the author of the brand new paper crafting title, home, paper, scissors. 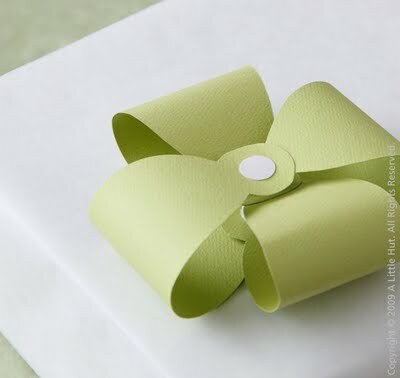 She has such a knack for doing things simply, but beautifully... this classy little bow, for example. And don't forget to leave a comment on my Blogiversary post by Sunday night if you'd like to be entered in the giveaway! your place card is exceptional! Your place cards are so beautiful. I love the casualness of those yarn spirals, and I love how the leaves are structured - so much prettier than a pinched coil. Bravo! !